With Sam (Noel Clarke) facing up to the new world, he realizes it also comes with new problems and new challenges. Ones that will require old friends to help him survive new dangers. From the moment the Grime music blared through the speakers and Fekky’s track Gossip ft. Giggs was booming around the living room, I was sure that this wasn’t going to be my cup of tea. My brother and cousin chucked it on. Challenging my film critic title to assess Clarke’s latest foray into the East London underbelly. 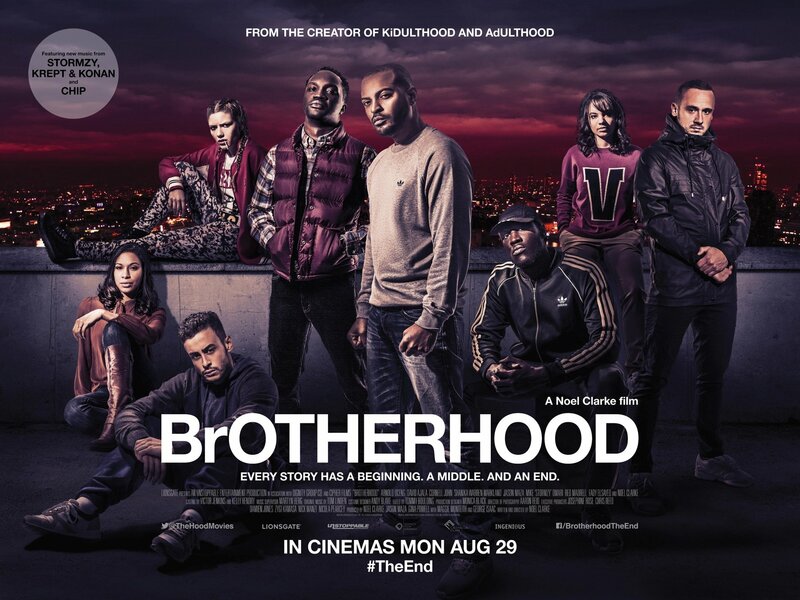 I’ll own up and admit that I haven’t even seen the other two films (Kidulthood and Adulthood) BUT as the events unfolded and the story got going, I actually didn’t mind it. A surprisingly watchable and entertaining (if predictable) gritty Brit gangster flick. I didn’t even need to watch the other two to grasp what was going on. It might fill in gaps and deliver little nods for fans of the trilogy BUT the back stories were quite easy to piece together. PLUS it helped that Clarke threw in a quick flashback here and there. Clarke was very good as Sam. The man desperate to make things right. Only for his past misgivings to punish the ones who are close to him yet again. He was an interesting protagonist that made you feel just as conflicted as himself. Cheering as he tried to turn his life around and then yelling at the idiot for making the same mistakes. I had to laugh at how easily he fell for the alluring Janette (Tonia Sotiropoulou). A femme fatale if ever there was one. Like watching a car crash. She really has a strange way of washing a shirt (People who have seen it will know what I’m talking about). Inevitably, it wasn’t long before Sam was thrown into trouble. Jason Maza (Welcome to the Punch) and Leeshon Alexander were brilliant as the head honchos Daley and HUGS. The Essex duo could have easily come off as really bad stereotypes BUT they mastered the balance perfectly and were highly unpleasant villains. You could feel yourself getting riled up at Daley’s cockiness and HUGS’ slimy demeanour as they tore Sam’s world to pieces. BUT it was Henry (Arnold Oceng – The Good Lie) who stole the show for me. The reluctant friend roped into helping Sam during his hour of need. Saving him from a good kicking by a group of thugs with nothing more than a TN cap and a Teenage Mutant Ninja Turtle toy under his coat. There was a lot more humour in this than I expected with Oceng delivering every time. Mocking up a fake argument with a traffic warden to evade the suspicions of his wife. Brilliant! BUT Oceng wasn’t just the comic relief. Henry’s confrontation with Yardz (Stormzy) was funny and heartbreaking at the same time. Prepared to face his fate and put everything on the line. I was actually surprised at how good Stormzy’s cameo was. Not every music artist can deliver on the big screen. I mean I could write a list. We all could. David Ajala left little to be desired as Detective Desmond ‘BUDS’ Lynch. I expected more from the Starred Up actor. Finally getting a meatier role. Only to be nothing more than a stocky copper. The lines were terrible and his delivery didn’t make things any better. Especially when BUDS vowed justice against Daley. Laughable. And that was part of the problem. For every good sequence, we had several poor ones. The plot was predictable. The middle act spluttered along which killed the pace. Olivia Chenery’s (Penny Dreadful) subplot felt tacked on and wasn’t explored at all. Her character Sariya’s revenge mission was completely overshadowed by Sam’s melodrama that it felt unnecessary. Sam’s reunion with an old foe should have been a tense affair. Thankfully, the frantic finale made up for the cliched exchanges and silly dialogue. The quick-cut punch ups were fast and furious (Even if it was all a little hokey). However, despite all my nitpicking, I was pleased with the ending. It ticked all the boxes and wrapped everything up perfectly. It did the job, killed the time and was better than I expected.